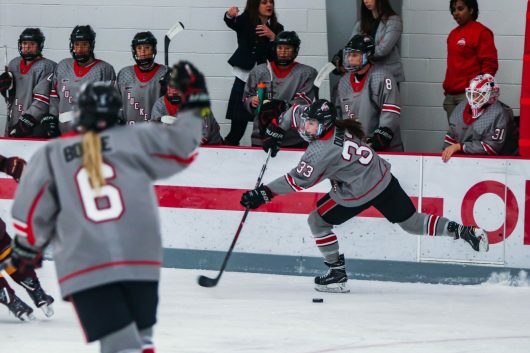 The Ohio State women’s hockey team dominated Minnesota State in the first game of a three-game series in the opening round of the WCHA tournament Friday with a 6-0 victory at the OSU Ice Rink. Ohio State redshirt junior Kassidy Sauve did not play due to an injur. In her place, freshman goaltender Amanda Zeglen saved all of the Mavericks’ 21 shots. Ohio State junior forward Maddy Field pulled off a hat trick, scoring one first-period goal and adding two more in the third period. Field’s final goal was her 16th of the season. Junior forward Charly Dahlquist, junior defender Lauren Boyle and freshman forward Emma Maltais also scored one goal apiece for the Buckeyes. Ohio State moved relentlessly early in the game and took a three-goal lead within the game’s first period. Dahlquist opened the game with a goal just 1:56 after the puck dropped, then Field and Boyle each scored with less than four minutes remaining in the first period. Minnesota State sophomore goaltender Chloe Crosby was replaced by junior goaltender Katie Bidulka after 46 minutes of play. Crosby had 16 saves and allowed six goals. Bidulka saved all five shots she faced. Muzerall said the Buckeyes’ strategy did not alter despite entering tournament play for the first time this season. Two weeks prior to the tournament opener, the Buckeyes traveled to Mankato, Minnesota, and split a series against the Mavericks. Earlier in the season, Ohio State swept a series against Minnesota State. The Buckeyes will once again face off with the Mavericks at 3:07 p.m Saturday at the OSU Ice Rink with the chance to advance to the second round of the conference tournament.